Adai is a protein-packed nutritious dish that is prepared by grinding together a combination of rice and different lentils. The batter is one that requires no fermentation and the adai can be prepared instantly as long as the rice and dals are soaked for sufficiently long enough (6-8 hours). I would recommend soaking the rice-dal mix for a minimum of two hours at least. The proportions of the dals and rice vary each time I make adai. This is how I prepare it sometimes. Soak the rice and dals overnight (or for at least 2-4 hours) along with the red chillies. Drain most of the water off and grind together with the curry leaves and ginger to get a coarse thick batter. Add a pinch of asafoetida and salt to taste. Heat a non-stick griddle or a cast-iron pan. Pour a ladleful of the batter in the center of the pan. Spread it out in a circular motion using the back of the ladle. 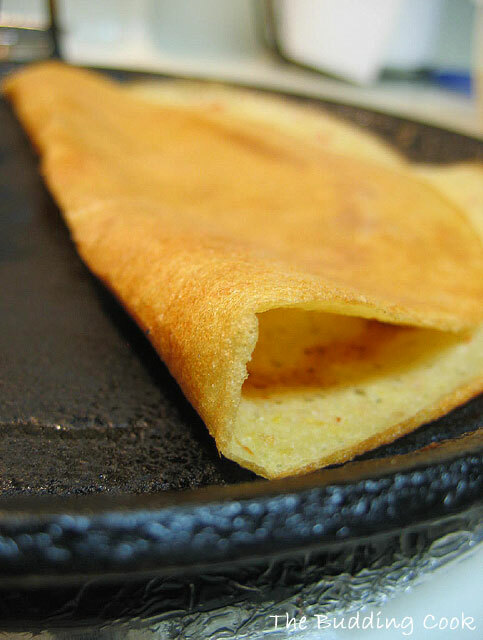 Make the adai thick or thin depending on your preference. I like mine thin and crispy. Drizzle some oil around the edges of the adai and also a little in the center. Cook till it turns golden brown on the bottom, then flip over and cook the other side. Serve hot with avial or jaggery on the side. I had mine with some tomato chutney and jaggery. This goes to Sunshinemom for FIC- Brown. I just came across this event being hosted by Sangeeth and realized that adai is the perfect example of a diabetic friendly meal. Lentils, which make up a major portion of this dish, are good for everybody, not just for people with diabetes. They’re rich in complex carbohydrates and protein, and high in dietary fiber, as a result of which they are digested slowly resulting in a steady and gradual rise in blood sugar levels (low glycemic index). This keeps one feeling fuller for longer. Lentils are also a rich natural source of B vitamins and minerals. Besides, its cholesterol-lowering properties helps reduce the risk of heart disease in diabetics. In short, it is a good idea for diabetics to have lentils in some form or the other with every meal. been meaning to make adai avial for a long time now! Hi TBC, can this be made without the rice? No fermentation, that i love. As it is cold weather it is always difficult. You've got a new header! :) Nice. I love the golden coloured thin adais you have... ravishing. I add too many veggies that i can never spread it thin enough.. This looks incredibly gorgeous, TBC. Adai has to be one my most favorite eats, especially when it's crispy and golden like that. Love it! I love adais, unbelievable how yours came out so thin and crispy. I've always made them thick and darker and I add onions and cabbage to mine. Nice golden color..and pretty pic.I add all lentils I have on hand while making adai..
looks so crispy and thin. ooh so tempting! Thanks you so much! your pics are awesome!!! Adai looks so crispy! Mouth watering.. Happy Diwali to you Tbc! The thin and delicate nature of these is just beautiful! Wow, that's a great close up photograph! That looks so crispy! delicious! looks just delicious, happy diwali to you and your family. Hello TBC..long time no see!..Wish you and your family a happy Deepavali! And adai super!.. :)..hope you also know abt Rice mela at my place!.. your adai looks so thin and crispy. i usually grind it coarsely!! nice! Nice to know that your chickpea tikkis were from Helene's site too :) I actually use the blog search tool on your site quite often... very handy. The adai looks crispy and delicious..mmm. Ever since I was lucky enough to obtain a wet grinder, I have started making all kinds of adais and they are so tasty. I add veggies too sometimes- carrots, onions- but it is difficult to get paper thin adais then as you have mentioned. Vaishali- thank you! :)You like it thin and crispy too! I'm glad I could participate. And you noticed my new header? yay! I did check out "rice mela". It would be a shame indeed if I did not participate 'cos I'm the kind of person who needs to have rice in some form or the other at least once a day! I did too. I just spread it a little thin 'cos I like it crispy, that's all. Your gajar ka halwa looks gorgeous! Nupur- it's so nice to see u here. Please post something, girl! We're missing you and your posts. I got myself a proper Indian mixer(no wet grinder yet) during my recent trip home. I seriously have no idea how I managed all these years without one!! hi TBC....(u still with the sma ename!..i think i will keep nagging u till u change that!..lol)..long time friend,,how u doin? 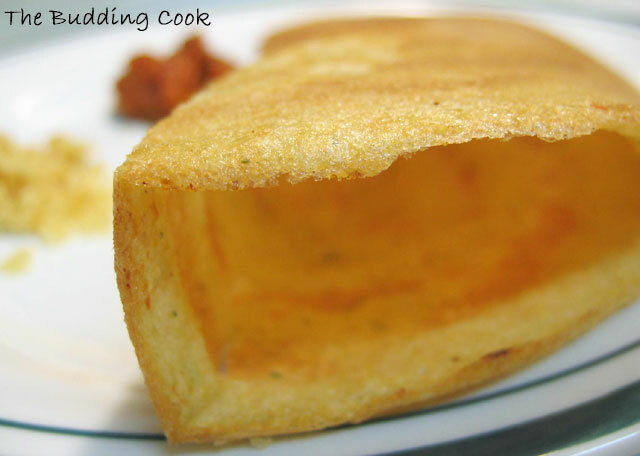 liked the luk of the adai..that was just exactly how my dad used to like these..crispy thin...like paper roast.. Thank you TBC for your wishes. Hope you had a great Deepavali too. I didn't cook much but made a Microwave Almond burfi, that's about it. This is like chrila no? Looks amazing. I especially like the no fermentation part! Nothing quite like hot, crisp adai with jaggery or home-mde butter. Yeah, that's how we have it. Asha- we don't really celebrate Diwali being Keralites and all that. ;-) Growing up in Bombay though, it was something that was always a part of my life only 'coz it was difficult to not get caught up in the festival spirit. After coming here, it's pretty much just Onam and Vishu for us. Thanks for the wishes though. Hope the work on the house is coming along just fine. Pooja! How are you? It's been ages since I saw u here! You have to try adai at least once. At least you said u like my pic, so itz o.k. BTW, what do u think of it??? Aparna- I agree! :D I like it with jaggery too. I don't care much for the adai-avial combination though. came here through sunshinemom's food colours round up. The adais look wonderful! Have been wantig to try something similar since long. You are inspiring me to finally do it. Look veryb tempting ! and beautiful pictures! Thank you! So when are you going to make it? we call it thosai, best with dry mutton curry. Tried this recipe yesterday and the Adai turned out great! I added black pepper when grinding. Next time thinking of adding some onions for new flavor!